In 1990 the Perth Mint Western Australia, the Australian mint, decided to produce a rather strange coin, not so much for what portrayed on the two sides of the coin and neither for the material of which it was made, but for the unusual size. It was a bullion coin weighing 1 kg, about ten centimetres broad and 1,5 cm thick made by 32 ounces of very pure silver. Considered the size and the weight it was not by sure a circulating coin, but it stimulated so much the gold investment field and also the Australian nationalism to become a symbol that every family wanted to have in their houses. It was the Silver Kookaburra, a coin where were represented on a face the Queen Elizabeth II of England and on the other this nice, very common and often extremely boring laughing bird, rightly named kookaburra. Usually we are accustomed to think that the kingfishers are birds living invariably close to the water from where they get the food for their sustenance whilst the reality shows that various genera and species of birds belonging to this group, have quite different behaviours and habitats. 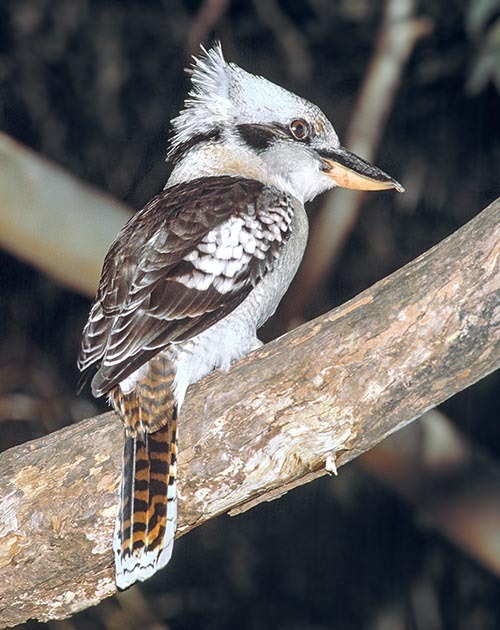 The famous Laughing kookaburra (Dacelo novaeguineae Hermann, 1783) is one of these. As a matter of fact, it belongs to the order of the Coraciiformes and to the family of the Alcedinidae, the same where are located various species of kingfishers. Australia, place hosting two of the four membres of this genus, is a country full of symbols so particular and different between them that it would not have any difficulty to represent them as emblems of their nation. Already their national coat of arms hosts kangaroos and emus, black swans and skylarks, representing the various regions composing it, others are remembered in other recurrences such as the platypus, the echidna, the koala, the wombat, the dingo but one overrides all thanks to its sympathy and sociability it has consolidated in the time with the human being. Its popularity is so strong that there is no field that does not have its reference. Stamps, coins, songs, tales for children, sports team mascots, even the symbol of previous Olympics show its name. 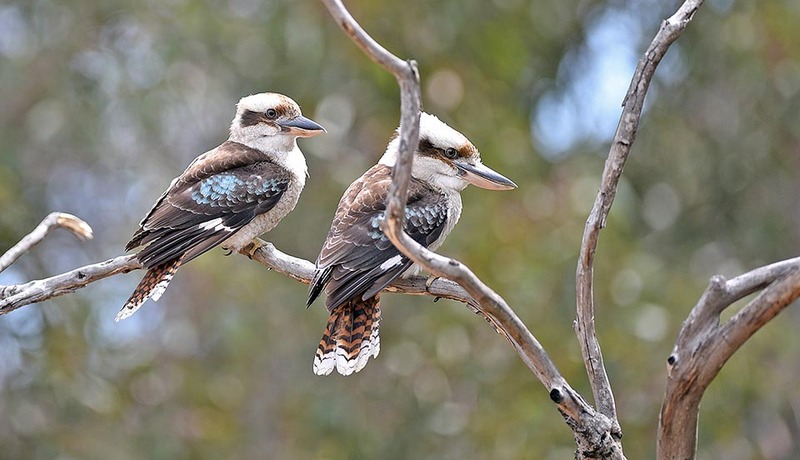 The kookaburra is ubiquitous in all Australian inhabited sites and share peacefully and without any fear, human habitats and activities. Its name has onomatopoeic origins and repeats that given by the old aborigenes of “guuguubarra”, imitating its strong and coarse call. Its presence doesn’t go unnoticed as at all times of the day and unluckily for those who have it close even at daybreak, it stays in full sight on some dry branch or on a street lamp, often in couple if not even in small groups and begins to emit these ungainly, strong and often lacerating cries. Also the vernacular name laughing given by the Australians does not contradict the type of cry it emits. Finally, it is a very confident bird, without any fear for the human presence so much to become in the rural zones and also in some public parks, a domestic animal but free and independent that at times gets to accept the food directly from the human hands. It is often trained and kept in captivity showing a friendly and very social character so to become practically a house animal. Other names given to this bird in the various languages are: in English, Laughing kookaburra; in German, Jäegerlist; in French, Martin-chasseur géant; in Spanish, Cucaburra; in Portuguese, Kokaburra; in Italian, Kookaburra sghignazzante and in Japanese an amusing Waraikawasemi. The etymology of the genus Dacelo coined by Leach in 1815 is a real linguistic nonsense, fruit of nastiness or, better, of an offensive form of the scientific world seriety, considering that it takes its cue from a childish way of coining neologisms in use during the early Middle Age. As a matter of fact, it is an anagram of the Latin term “Alcedo” = kingfisher as are Cedola and Lacedo also genera anagrams of the same name. Classifiers pranks of time gone. Conversely, novaeguineae comes from the Latin “novus” and Guinea. The first specimen (probably it was the congener Dacelo leachii) was given in 1766 to the European ornithological world by Joseph Banks, the ships’ botanist of Capt. Cook’s expedition, who said having collected it on the islands around New Guinea, but probably it was on the York Peninsula in Australia considered that here it is very common whilst in the first one is poorly present. 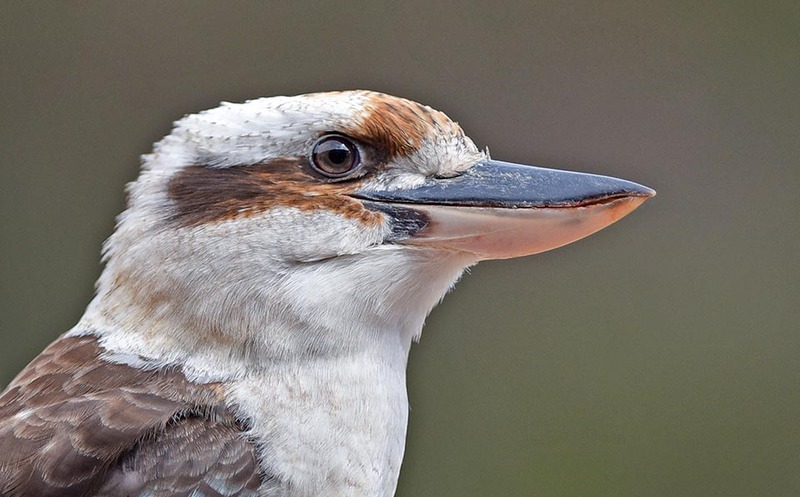 The laughing kookaburra (term reported from the original English name that in Italian sounds cucabarra), lives only in Australia, in the eastern part of the continent, in the area going from York Peninsula in Queensland up to Adelaide in South Australia. It is occasionally present also in Tasmania, in northern New Zealand and in Perth area, in the extreme south-west of the continent, because introduced by the man. 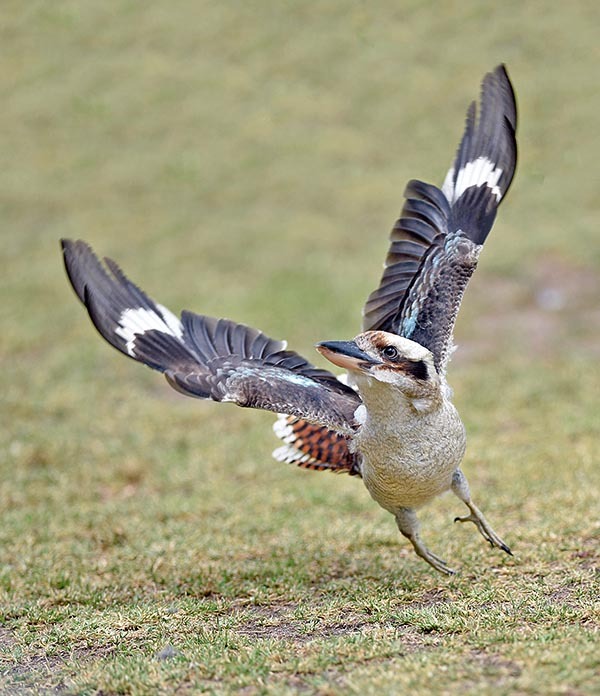 The most similar species and with whom it is easily confused, is the Blue-winged kookaburra (Dacelo leachii) that conversely occupies the entire northern part of the Australian continent and some islands around New Guinea. In the territories where they do overlap, these two birds are often in competition probably proving that both species time ago belonged to the same strain from which then they should have parted. It is a sedentary bird and keeps the territory also after the nidification period. Being more a fisher than a “hunter”, as French say, the kookaburra has no climate problems and neither of lack of water from which to depend therefore it does not suffer from the strong drought periods that seasonally hit parts of this country end not even of the period of the summer showers at times extremely violent. The kookaburra lives indifferently in dry or humid locations, primary and riparian forests, open thickets or eucalyptuses forests, gardens or uninhabited savannahs, public parks and even inhabited places. The important is that in its territory stands sufficiency of food and trees with hollows suitable for the nidification. It is a typical solitary bird that remains constantly in its territory that defends and preserves against foes and opponents fiercely. It is also curious and as soon as we get close to it, here it is coming out from its usual hideouts, mainly the leafy tops of tall trees, and immediately fluttering at a certain distance emitting its alarm cry controlling the movements of the intruder. Nevertheless, it has been able to evolve with extreme facility and where it got the occasion, has come in contact with the human being overlapping the relevant territories. Its absolute carelessness towards the man is also expressed towards the domestic animals that often jeers perhaps more for fun than for defence. Its impudence added to its senselessness, are so strong and instinctive that at times it does not fail to steal the food left inadvertently on the picnic table, choosing, of course, the meat morsels. Perhaps due to this inborn predisposition, it has found benefit from the human presence and has taken advantage of his protection. The laughing kookaburra is the biggest membre of the alcedinids, with a length of more than 40 cm, a weight of 450 g and a wingspan of 60 cm. This is why, seen the size, it was initially classified as Dacelo gigas, a giant amongst its similars. The body is stocky and robust with very pronounced head and an exceptionally big bill. A robust bill, conical, boat-like widened, with ample base ending with a very sharp tip. A deadly weapon, as we shall see later on. The upper jaw is greyish whilst the lower one is yellowish. The body is totally white crossed at the height of the eyes, by a dark brown stripe that starting from the bill joins behind the nape. The eyes are dark. These last details distinguish it from the congener blue-winged kookaburra that, conversely, has the head almost completely blackish and the eyes of pearl colour. The alar coverts are brownish with shoulders and overtail of a nice light blue very evident when under the sunlight. Only when flying it shows a big white alar spot, well marked. The tail is of a nice brick red colour barred by ample black lines and, when wide open, evidences a whitish terminal edge, on the contrary of its congener who has it completely brown. The female, of slightly bigger size, differs from the male due the less bright overtail. The young have head and trunk of a dirty white colour, slightly dotted of brownish and evidence colours less accentuated and clear. Overall, have been classified four species in the genus Dacelo. Rightly, in addition to ours, the Blue-winged kookaburra (Dacelo leachii), the Spangled kookaburra (Dacelo tyro) living on the Aru Islands and on a small coastal area of New Guinea and the Rufous-bellied kookaburra (Dacelo gaudichaud) typical to New Guinea. The kookaburra usually nidifes once a year, occasionally twice. It is monogamous and the couple is faithful all over the life. It has not the typical habits of our Common kingfishers (Alcedo atthis) in preparing the nest but prefers to find niches, cavities or hollows without having to dig those long and tiring underground tunnels. It usually nidifies in the trunks of the trees, at an average height of 8 m, but also close to the ground, in natural niches or even partially dug after having taken off the rotten part of the wood and creating the room sufficient for placing the nest. Rarely it digs small holes in the mounds without entering deep and does not disdain the use of nest boxes. Usually it lays 2 or 3 eggs but they have found nests with five of them, possibly fruit of the deposition of more females. The brooding lasts up to 4 weeks and the chicks come to life featherless. The brooding and the care of the chicks is done by both sexes and at times also by occasional attendants, probably sons of previous broods, that besides the help in the caring provide also an increment of the defence. The young take off after about 5/6 weeks and the sexual maturation occurs after two years for the females and upto the 4 years for the males. The life expectancy is of about ten years. 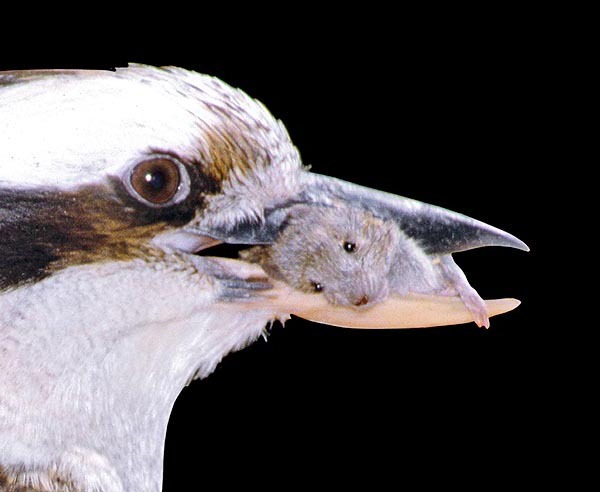 The kookaburra is carnivorous and insectivorous. Its main preys are little snakes, lizards, mice, amphibians and big insects but does not disdain small nestlings of other birds that often predates directly from the nests. Usually it swallows the victims in one gulp, but if needed dissects the preys with its very strong bill, tearing them in small pieces. It often uses slamming repeatedly the preys still alive directly on the branch on which is perched adopting the same mechanism used by the kingfishers. 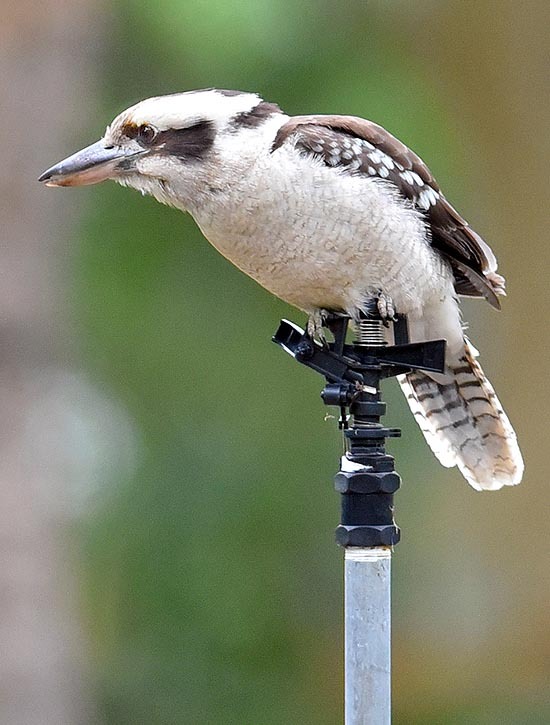 The laughing kookaburra is well diffused and distributed in its area and the species does not have any risk, therefore is not subject to any particularly special protection. → To appreciate the biodiversity within CORACIIFORMES please click here.